We support all teams at the Varsity, Junior Varsity and Middle School levels, as well as overall Lower School and Middle School athletic programs. All Falcons, from Kindergarten through 12th grade have benefited from the financial and volunteer support the Falcon Club has given back to the Athletic Department. The Falcon Club welcomes new members and encourages volunteering! Falcon Club Golf Outing Chair, at pwoodson@woodsonlawfirm.com. Show Your Spirit and Join the Falcon Club TODAY! To purchase FWCD Spirit Wear, visit the Falcon Nest Spirit Shop during all varsity football home games or go to the Campus Store. 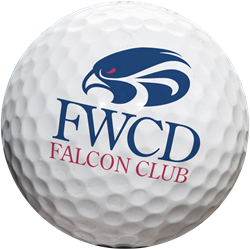 Each year the FWCD Falcon Club publishes three, four-color seasonal (fall, winter, spring) sports programs that include advertisements and sports information on all Upper School athletic teams. The programs are a great opportunity to highlight your business. Ad sales help the Falcon Club support our student-athletes and coaches, as well as the FWCD athletic program. Ads run in all three seasonal programs. Contact Cynda Wroten at cyndawroten@hotmail.com to reserve your ad for the 2018-19 season. Prefer to pay by check? Print the Ad Reservation form and mail.